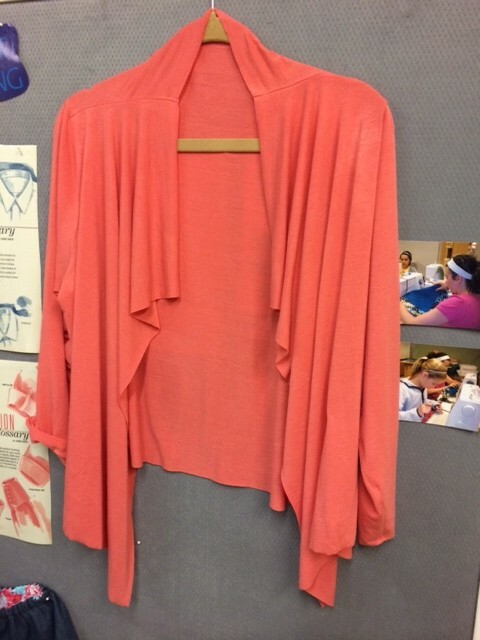 This month’s project is the E-shrug from Linda Lee’s Sewing Workshop. It is a downloadable pattern for $6 on her website. Quick to sew and a wardrobe staple. Debbie used a melon colored knit from Treadle Yard Goods. Serger Club meets this Thursday, March 20, at 10:30, Hancock Fabrics, Southtown. Sign up on this website under Classes at Hancock above. Several of you stopped by Hancock yesterday and picked up kits-thank you! We sewed a few together and realized that the directions were a bit confusing. The bottom line is a 24″ wide by 30″ tall bag with a drawstring at the top and a 12″ wide by 15″ tall pocket on the outside. Serged seams or french seams keeps it clean on the inside. If you use a 60″ wide fabric, the fold will be at the bottom and the selvages will be at the top so they can simply be turned over to the outside or inside and stitched down to form the drawstring casing. Very quick to put together. We can always add the drawstrings if you just want to sew the bags at home. We’ll be at Treadle tonight (6-8 pm) for a three part class to take you from threading your serger to whipping up a tee. Only two spots left…call Treadle to sign up 651-698-9690. Make a bag, learn to serge, get fitting help, sew the E-shrug. You decide what you’d like to do. Click on Classes at Chan Vac Center above to register for one of the classes. Posted on March 18, 2014 by KristinPosted in classes, Schedules, Sewing classesTagged Bags for Kids, E-shrug.